London is the one of the largest cities in Europe. In a little more than 600 square miles, visitors can be transported through the centuries walking around tiny cobblestoned lanes and entering into pubs dating back as early as the 17th century. Tower Bridge and Central London Skyline on the River Thames. Photo by Zygmunt Spray. Along the River Thames, visitors can savor historic icons of architecture from House of Parliament and Tower Bridge while enjoying new timeless landmarks like The Eye and The Shard. London Bike Share Bicycles. Photo by Zygmunt Spray. For travelers looking to see London in a short time frame while minimizing their environmental impact, the bike share scheme is the way to go. The city has more than 270 bike stations and an ever-growing web of cycle-friendly lanes. The scheme also gives you the freedom to pick up bikes and drop them off where you like. This type of flexibility is perfect for a city where rain showers can pop up at any time or a pub can tempt you in for a couple of pints at any corner. Here is a map and detailed directions for seeing some of London’s iconic landmarks through the city’s bike share scheme. This route can be completed in one-day. If you’re interested in spending time in the museums or the passing pub, you may want to stretch this route over 2-to-3 days. Start at Tower Hill Station (on the Circle and District Line, yellow and green, respectively). From here take a short walk to the Tower of London. Walk along the Thames and up the steps onto Tower Bridge. Walk across and enjoy this iconic bridge. You’ll be able to see the HMS Belfast and London City Hall. Head to the first bicycle pickup point, on the main road behind London City Hall. Tower Bridge and the Tower of London. Photo by Zygmunt Spray. Walk down to the river and past the historic reconstruction of the Globe Theatre—the famous home for William Shakespeare’s plays—until you reach the Tate Modern. From here, wander around The Tate before walking across the Millennium footbridge towards St Paul’s Cathedral. On the far side of St Paul’s, you’ll find a bike station. Cycle west on Holborn Street and follow the directions to the British Museum. (12-18 minute ride). Courtyard in The British Museum. Photo by Zygmunt Spray. From here it’s a short ride down typical London streets, some narrow and cobbled, to Trafalgar Square. (8-12 minute ride). I suggest leaving the bicycles behind for the next section of your tour as it is very busy with pedestrians. Walk down and cross the River Thames on the Golden Jubilee Bridge. Walk along the South Bank and take in the London Eye and London Aquarium. Big Ben and Westminster will eventually come into view. Cross Westminster Bridge and walk inside Westminster Abbey, to see where British royalty get married. You’ll be able to pick up a bicycle just a short walk from Westminster Abbey. Once you’ve picked up a bike, cycle along the path on the right side of The Mall, making sure to stop and take in Buckingham Palace. If you want to see the changing of the guard, this ceremony only happens every other day at 11am (10am if on a Sunday), so plan accordingly. Visit here for more details. Cross the road at Hyde Park Corner, and enter Hyde Park. Follow the cycle route along the Serpentine. At the road bridge, turn left and then right to stay in the park. The Albert Memorial will be on your right. You won’t miss it! Leave Hyde Park just past The Albert Memorial and find the final docking station just across the road. The Royal Albert Hall and London Taxi. Photo by Zygmunt Spray. Once you drop off your bike, you’ll be around the Royal Albert Hall. Walk around the building and to the left to follow Exhibition Road down past The Science Museum, the Victoria & Albert Museum and the Natural History Museum. All are worth a visit, but if pushed for time, go into the Natural History Museum. 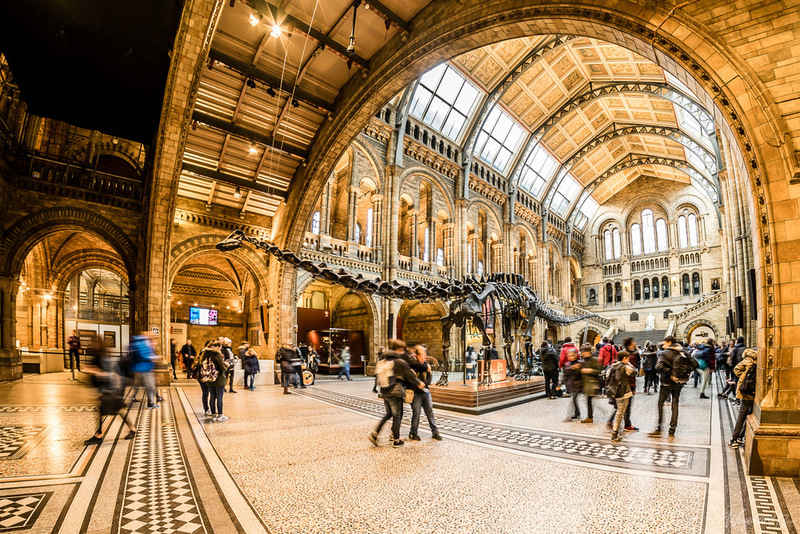 The building itself is an amazing sight... and you can say hello to “Dippy,” the large Diplodocus dinosaur in the main hall. The finishing point of the tour is South Kensington tube station (on the Piccadilly/Circle/District Lines) where you can get take the tube back into central London simply and easily. To rent a bike you’ll need a credit card. You can either just follow the instructions at the terminal to pay, get a code, and take a bike. Alternatively, you can use the Santander Cycles app (Google Play/App Store) which can be used to locate your nearest bike station, plan a route and hire a bike. If you’re going to use the bikes regularly over an extended trip in London, you can also purchase a key that streamlines the rental process. Check maps for cycle routes. Google Maps is usually fairly good in cities such as London for finding cycle paths and roads that are better for cyclists. Make sure you’re aware of highway code for the country you’re in. Check the tires and brakes on the bicycle before committing to renting the bike. Squeeze both tires; they should be firm. Pull both brake levers to check that they are working properly. Adjust the saddle to a height that you feel comfortable at; remembering that too high or too low can make it more difficult to control the bicycle. Wear a helmet. It may not be convenient, but if you’re going to be on the road it’s worth the hassle to protect yourself. Your guide for a conscientious trip that lives up to the city’s cosmopolitan reputation. What if you want more freedom to explore a city? What if you want to see the city in a sustainable way? Many cities now have the answer. Bicycle share schemes.